Francis “Frank” Joseph Katen, (1903-2001), his real name is Francesco Giuseppe Cincinnati Catanzariti. He was born on January 21, 1903, the son of Rocco Antonio Catanzariti (1870-1917) and Ataliana Labianca (1883-1976) in Plati, Catanzaro, Calabria, Italy. However, several birth records report him born in New York. The correct location is not known for certain at this time and very well may be America making him a Calabrian American. The 1915 New York State Census lists his father working as a designer and all of the six children given English forms of their names cited as being born in the U. S. At that time the family lived at 1363 71st Street, Kings, New York. After the death of his father his mother remarried taking on the name Lacalamita. Sometime between 1915 and 1925, when Italians were treated very unfair and biased especially during the case of Sacco and Vanzetti he changed his name to Katen. He married Ruby Locke (1904-1933?) in 1924, daughter of Anna Kueffel and Herman Locke. Her father was born in Germany and her mother a native New Yorker. In the 1925 New York Census he is listed as being 27 years old working as a printer. If correct he would have been born in 1898, not 1903. At that time he was president of E. L. Vandergrift Inc., 299 Madison Avenue, New York. The 1930 U. S. Census lists him as 39, i.e., born in 1899, married to Ruby with two daughters Ruby and Estelle, with him as the owner of a novelties company. It is believed by the family that Ruby died giving birth to Frank, Jr. He began dealing coins five years after the death of Ruby in 1938 through his novelties company. He moved to Wallingford, Connecticut briefly in 1939 and removed to New Haven. The 1940 U. S. Census lists him as a widower living with his fifteen year-old daughter Ruby Louise Katen (1925-2003) and his occupation as a Government Inspector. Another 1940 U.S. Census reports him with three children Ruby Louise (1925-2003), Frances (1928-), Estelle (1929-), and Frank J Katen, Jr (1933-). He joined the ANA in 1942 and in February was given ANA Member No. 8920. He had married Frances M. Katen (1911-) about this time. His mailing address at that time was 18 Pearl Hill, Milford, Connecticut. Oddly, his application for membership in the ANA neither appears in the January 1942 issue nor in any issue of 1941 of The Numismatist. In 1944 he operated from his home at 18 Pearl Hill, Milford, Connecticut. 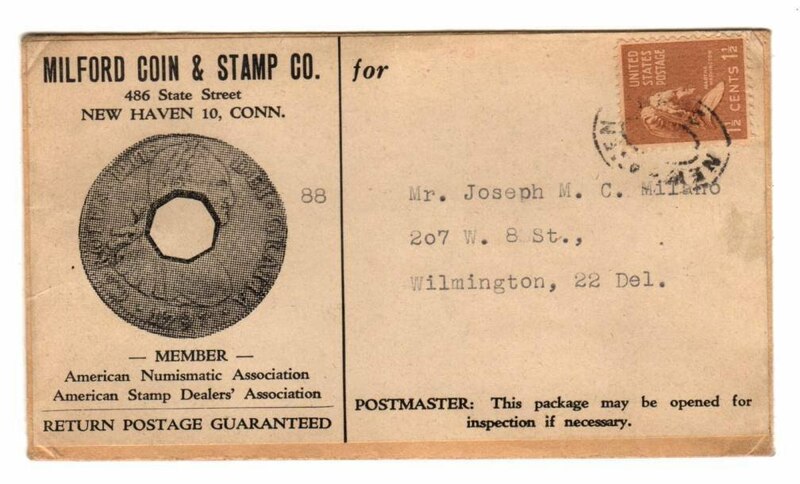 From 1916 through the 1920's the Edgewood Stamp Company had been the philatelic dealer located at Milford, Connecticut. The Collector's Shop at 280 Elm, New Haven Connecticut was another established stamp dealer throughout the 1930's. Also during the 1930's Ellis C. Hulme was a stamp dealer at Hartford, Connecticut. J. M. Coffee Jr., of New Haven was an avid transportation token collector, who published in 1950, The Fare Box, a monthly newsletter devoted to that field of numismatics. Katen moved right in and took charge of the established market there. The 1942-1945 Milford, Connecticut City Directories lists him married to Frances M Katen and oddly reports him working as a Government Inspector instead of a coin and stamp dealer. In January 1945 he opened a shop at 486 State Street, New Haven, Connecticut. He and Frances were members of the New York Numismatic Club. He ran a full page advertisement for his coin shop selling German Notgeld in January issue of The Numismatist, page 68. Fig. 1. Earliest known Katen coin dealership envelope doing business as Milford Coin & Stamp Company circa 1945. The label is pasted onto a 3" x 5-3/8" clasp envelope. Scott #805 1 1/2 cent Martha Washington, bister brown, issued May 1938. Postage commercial bulk rate with double oval canceller New Haven Post Office. Courtesy Lupia Numismatic Library. In April 1945 he named the shop Milford Coin & Stamp Co. 487 State Street, New Haven, Connecticut, which he ran under that name until sometime between 1964 and 1966. He was a charter member of the Nutmeg Stamp Club in March 1945, and elected vice-president. He was one of the founders of the American Coin Dealer's Association. The Wilkes-Barre Coin Club invited Katen to talk about one of his favorite subjects, "Odd and Curious Moneys of the World". Wilkes-Barre Record, Tuesday, October 8, 1946, page 13. Fig. 3. Second earliest known Katen coin dealership envelope doing business as Milford Coin & Stamp Company 1948. Postage stamp Scott # 971, 3 cents, Peter Stuyvesant , Early and Modern Fire Engines, bright rose carmine, issued October 4, 1948. This is an example of a very early use during the first 10 days. Courtesy Lupia Numismatic Library. On July 20, 1951 after his expulsion from the ANA in August 1950 he moved to Europe with his second wife Frances M. Katen for a little over a year returning about October 1952. He was a founding member of the International Association of Professional Numismatists (IAPN), which was created in 1951. A notice in the Naugatuck Daily News, Friday, July 27, 1951, page 7 reports he moved to Germany. He sold all of his household good through Phillip Sweedler, Auctioneer at New Haven. He opened a coin, numismatic literature shop, and mail order business at 1726 Upshur Street, NW, Washington, D. C., running his first ad in the November 1952, Numismatic Scrapbook. Fig. 4. 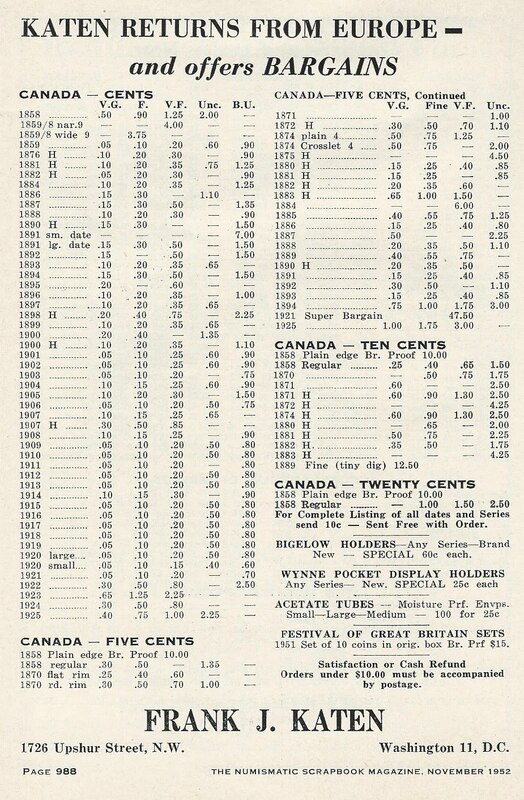 Katen Returns From Europe ad in the November 1952 Numismatic Scrapbook. In December 1952 he began advertising numismatic medals, tokens, badges and literature in Katen's Bargain List, a monthly. Courtesy Lupia Numismatic Library. Fig. 5. Advertisement in January 1954 Numismatic Scrapbook selling numismatic literature. As this ad states it is only a partial listing, the complete list found in Katen's Bargain List. At the time he was married to Frances M. Katen. Courtesy Lupia Numismatic Library. On June 24, 1954 he sailed on the S.S. Evangeline with his wife Frances M. Katen from Yarmouth, Nova Scotia to Boston, Massachusetts. In 1964, he married twice divorcee Laurese Byrd Boone Pusey (1917-2014), former wife of Linwood Wilson Pusey from 1932-1937; and former wife of a Mr. Gordon. She was born on September 15, 1917, in Crisfield, Maryland, the daughter of Lloyd Weldon Boone and Athol Byrd. They moved to Laurese's home state of Maryland in the early 1970's. She had an Associates degree in English and worked as a publicist and advertiser. In the February 1964 issue of The Numismatist, page 192 is a photograph of the officers of the Nation's Capital Coin Club, newly formed in the Spring of 1963, showing Frank J. Katen as the vice-president seated in the front row and Laurese Byrd Gordon (the future Mrs. Katen) standing in the back row. Fig. 6. 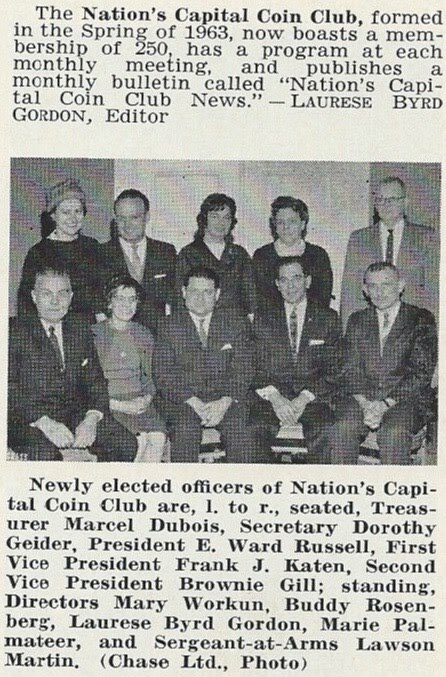 April 1964 The Numismatist, page 192, Photo of the officers of the Nation's Capital Coin Club. Seated front row, Frank J. Katen. Standing back row [Mrs.] Laurese Byrd Gordon, Editor, Nation's Capital Coin Club News. In the 1950's Laurese headed the Advertising and Promotion Department of WTOP Radio. AT that time she also served as the Advertising Director for the Watergate Inn and Normandy Farm, Washington, D.C., twenty years before the scandal with Richard M. Nixon. In 1960, Mrs. Laurese Gordon was executive secretary of the Advertising Club of Metropolitan Washington. In December 1964 Frank J. Katen was elected president of the Nation's Capital Coin Club, and the now Laurese Byrd Katen as the secretary. Apparently they married about the time the photo was published on February 22, 1964, at the Francis Asbury Methodist Church. Her uncle Dr. H. C. Byrd, former president of the University of Maryland gave her away at the wedding. Fig. 7. Frank and Laurese Katen ad in The News, Tuesday, December 16, 1969, page 2. This ad gives reference to his being established in 1938 "31 Years of Service to Banks & Lawyers". In October 1965 Laurese B. Katen joined radio stations WDON and WASH as public relations and sales coordinator. In April 1969 the ANA apologized to Katen for his expulsion in 1950 exonerating him of all wrongdoing and granting him restoration in the Association. He and Laurese immediately began an active advertising campaign that year in The Numismatist beginning with the April issue advertising their "Book and Coin Auction Public and Mail Bid, Sale No. 33" in a half page ad on page 540. In 1978 Frank and Laurese received the ANA award the Medal of Merit. Fig. 8. Laurese Katen in 1995. Photograph printed in The Numismatist, February 1995. 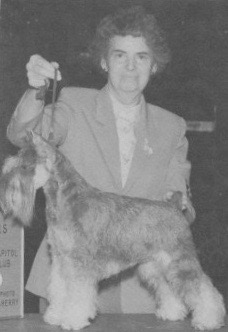 She was a dog breeder raising Schnauzers. During that period Frank and his wife Laurese worked side by side in the coin shop. They began to focus on the use and sale of numismatic literature. It was from this new focus on numismatic literature that we find some years later Aaron Feldman coin the phrase (pun intended) "Buy the book before the coin", developing a new generation of c informed buyers. From 1966 to 1997 the coin auction sales no longer were part of the Milford Coin and Stamp Company but became the new business trading as Frank and Laurese Katen. In 1993 Frank J. Katen received the ANA Presidential Award. He died January 21, 2001. ANA Life member 132. He is buried in Gate of Heaven Cemetery in Silver Spring, Maryland. He was survived by his wife Laurese, two daughters Dr. Frances Katen Burke, a political scientist of Boston, Massachusetts; and Ruby Goldsand of Virginia Beach, Virginia; a son Frank Katen, Jr., and a stepson, Larry Keith Pusey, both of Silver Spring, Maryland; a sister, Anita Marian Katen Richau (1915-2001) of Las Vegas, Nevada; a brother, Michael Katen of Florida; a step-brother Ferdinand Grayson of New Orleans, Louisiana; six grandchildren; and three great grandchildren. Laurese died on December 12, 2014 at her home 14717 New Hampshire Avenue, Silver Spring, Maryland and is also buried in Gate of Heaven Cemetery in Silver Spring, Maryland. Frank J. Katen was a member of at least a half dozen numismatic organizations, including the Royal Numismatic Society, Numismatic Bibliomania Society, New York Coin Club, Montgomery County (Maryland) Coin Club, Metropolitan Washington Numismatic Association and the former Middle Atlantic Numismatic Association (MANA), which became part of Eastern States Numismatic Association - a co-sponsor of the ANA World's Fair of Money in 2000. Special thanks to Kay the granddaughter of Frank J. Katen, Sr. for her kind assistance. He flew on Pan Am from New York to London on July 20, 1951. The New York Passenger list of January 28, 1952 list Frank J. Katen and his wife Frances M. Katen sailing from Rotterdam to New York. 33. May 23, 1969 - his first ad after exoneration by the ANA in The Numismatist, April page 540. 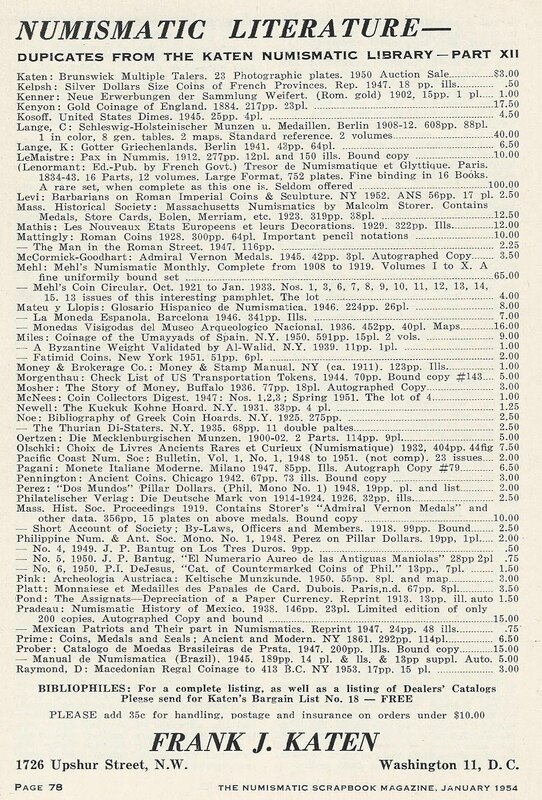 1939 Wallingford Connecticut City Directory (1939) : 173, moved to New Haven. Milford, Connecticut City Directory, (1942) : 207 lists Frank J. Katen and his wife Frances M. Katen. The Numismatist, February (1942) : 121 ANA Member No. 8920. 1954 Washington D.C. Directory, page 670 lists Frank J. Katen and his wife Frances M. Katen.